ST. JAMES—The Naturally Meramec Consortium is hosting a free workshop on produce safety presented by the University of Missouri Extension, on Dec. 6 from 8:30 a.m. to 12:30 p.m. at Meramec Regional Planning Commission (MRPC), #4 Industrial Drive, St. James. The course is a four-hour abbreviated training session taught by MU Extension specialists, that teaches fruit and vegetable growers the core principles of produce safety, the new FDA Food Safety Modernization Act (FSMA) produce safety rule. Topics covered will include produce safety basics such as worker hygiene, soil amendments, wildlife and animals, agricultural water and post-harvest handling; FSMA requirements and exemptions; and water sampling and testing. 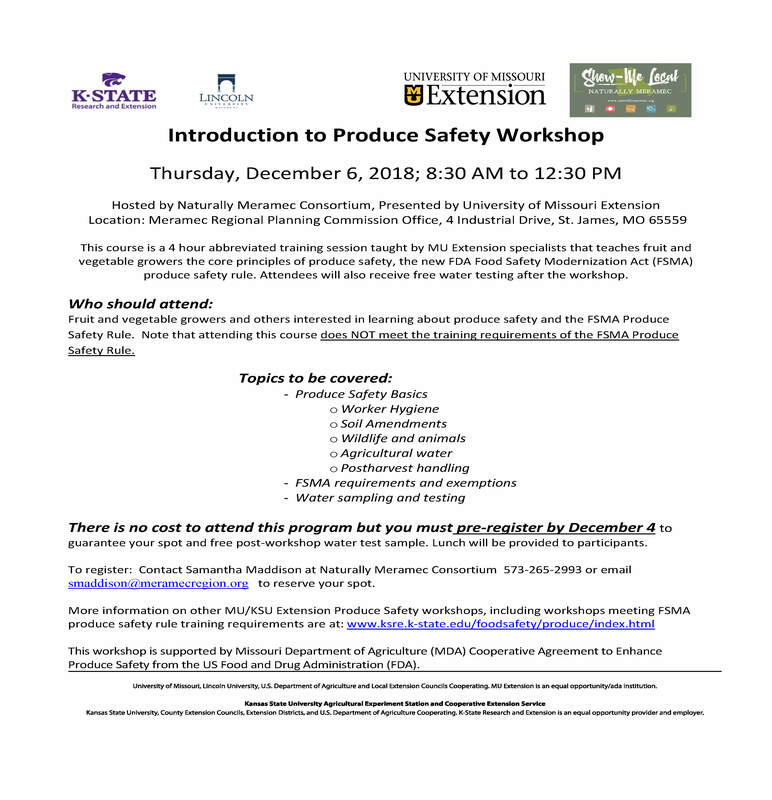 Fruit and vegetable growers and others interested in learning about produce safety and the FSMA Produce Safety Rule are encouraged to attend. Attendees will also receive free water testing after the workshop. Please note that this course does not meet the training requirements of the FSMA Produce Safety Rule. To register contact Samantha Maddison, Naturally Meramec program specialist with MRPC at 573-265-2993 or via email at smaddison@meramecregion.org. The Naturally Meramec consortium, coordinated by MRPC, was developed to enable businesses to work together, sell and highlight local products with marketing tools such as brochures and interactive websites. The Naturally Meramec website enables travelers to preplan visits to agri-tourism businesses as destinations. For more information please contact Samantha at 573-265-2993 or smaddison@meramecregion.org. The Naturally Meramec meetings are open to the public. Formed in 1969, MRPC is a voluntary council of governments serving Crawford, Dent, Gasconade, Maries, Osage, Phelps, Pulaski and Washington counties and their respective cities. Presiding Commissioner of Washington County, Marvin Wright, serves as chair of the board. A professional staff of 25 offers technical assistance and services, such as grant preparation and administration, housing assistance, transportation planning, environmental planning, ordinance codification, business loans and other services to member communities.